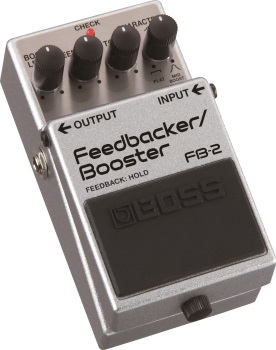 The unique FB-2 Feedbacker/Booster packs a world of expressive, versatile boost into a single stompbox. Seamlessly morph from flat, clean boost that doesn’t spoil the nuance of the original tone to an amazing mid boost for high-gain solos, or dial up a bright and clear treble boost to lighten the tone. And that’s only half of the picture...the FB-2 can generate smooth and natural amp feedback as well. The FB-2’s versatile tone, simple operation, and low noise are made possible through BOSS’ latest technology and decades of know how.